I was in Walmart today and noticed they have a 7" and 8" tablets that have similar specs to the Fire tablets. I decided to pick up one of each to see how they compared. They both have Android 6.0.x installed, and come with minimal bloatware. DomoPad installed easily and the initial observations are pretty good, but I'll do a complete review of each later. They were $50 for the 7" and $68 for the 8". The could be a good alternative for those looking for an inexpensive tablet without the hassles of the FireOS. How much RAM do they have? It would be interesting to know if they are boot loader locked as well. Can the bloatware be removed or it is part of the ROM? Yep, looks like it was just Vudo, Nook, and Walmart apps and they all uninstalled easily, at least on the 8" which is the one I'm playing with at the moment. 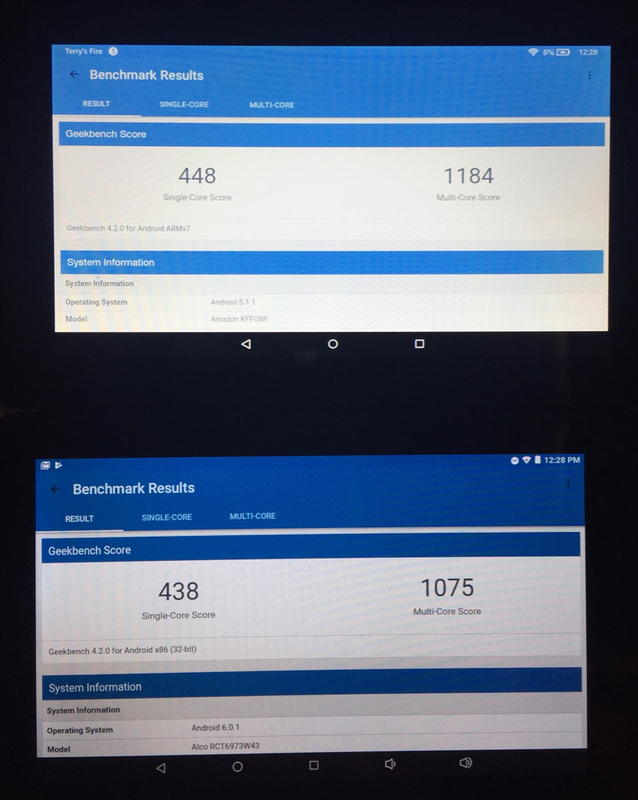 Interestingly, Geekbench reports an Intel Atom processor and a paltry 895MB RAM. It's probably fine if it's just running DomoPad but I wouldn't load it down. The Fire 8 has 1.34 GB RAM but has a slower ARM proc. In the pic below, the Fire 8 (previous gen) is on top, the Walmart Nextbook Ares 8A on bottom . BTW setting DomoPad as the Launcher works great, and using the “No Lock” app from the Google Play store worked great for removing the lock screen. With the 7” Tablets, the Amazon Fire (previous gen) nudges out the RCA Voyager 3. As before, Fire 7 on top, Voyager below. Same minimal bloatware on the 7, all of it removed without issue. 888MB RAM in the Voyager 3. Domopad loads and runs quite well on these. It’s also easy to set up DP to be the launcher, and to disable the lock screen. I think either would be fine substitutes for Amazon’s offerings and are a lot easier to setup, plus the version bump in Android is nice. My favorite is the 8”. It’s hard to beat at $68, it’s faster than the Fire 8, and it’s dimensions are a few millimeters smaller in H&W than the 8” Fire. It’s maybe a millimeter thinner too. The RCA 7” is a bit thicker by a millimeter or so than the Amazon 7”, but like the 8” one, is a few millimeters smaller in H&W. It’s screen sits a little off-center in the bezel which triggers my OCD. It’s power connector is a separate barrel connector rather than the normal USB. Nice, I used it all day yesterday and didn’t notice anything out of the ordinary in comparison to the 7” Fire. It’s definitely easy to setup. Forgot to mention this above; hold on to your receipt from Walmart, printed on it is an activation code that MUST be entered into the tablets on first boot; different, but effective against theft I suppose. That RAM could be an issue if you were switching to other applications and back -- would be more likely to boot background apps out of RAM and have to reload from storage. While not terrible, switching between something like Sonos app and DomoPad could be slower. Intel Atom processor is interesting - Google devices are slowly bringing more Intel chips into the fold, such as the i5 & i7 processors in the Pixelbooks. They (Intel chipped devices) have always been around, but not in high quantities.